The places where one thing opens onto another — a door, a harbor, a gate, a border, a mouth — are inherently interesting. They attract the eye and the attention. They are places of drama, of excitement. 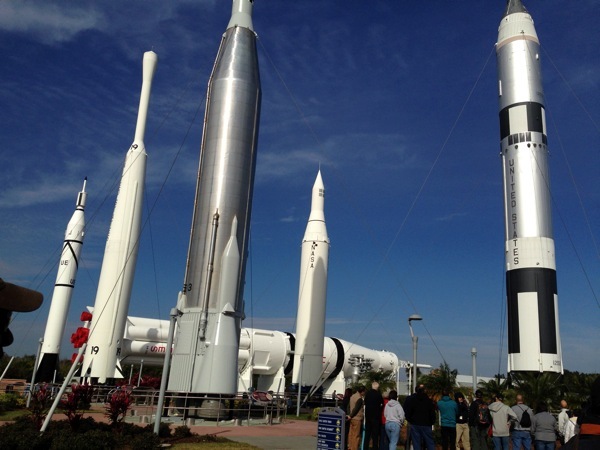 Kennedy Space Center is the gateway between the United States and space. I visited there last week, as an invited guest of NASA. 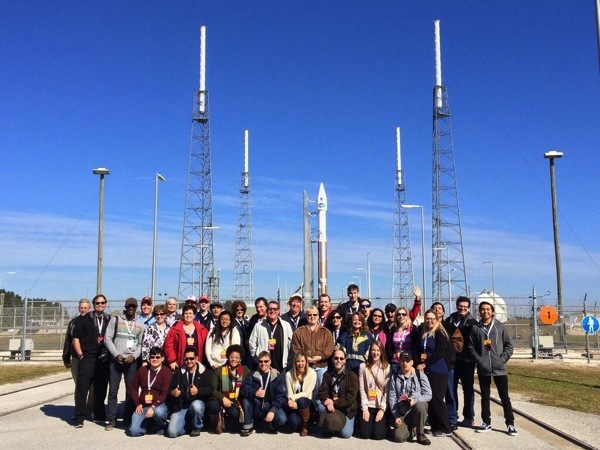 This story begins a month or so ago, when I saw a notice on a mailing list about something called a “NASA Social” around the launch of the TDRS-L satellite from Cape Canaveral in January. NASA holds these events several times a year as opportunities for public outreach and education. If you follow NASA on any social media (Twitter, Facebook, etc.) you can fill out a web form to put your name in a hat, and if you’re lucky you might get picked to attend the event (on your own dime). I filled out the form and proceeded to forget all about it, until two weeks ago when I got the email saying I’d been selected to attend! I had to cancel a few things to make it happen, but I figured it was too good an opportunity to pass up. The TDRS system (it’s pronounced “teedris” and stands for Tracking and Data Relay Satellite) is a network of geosynchronous satellites which provide nearly continuous high-bandwidth communication with spacecraft in Low Earth Orbit, including the Hubble Space Telescope and International Space Station, and TDRS-L is the 12th one launched (hence the letter L). Space geeks of a certain age (or who have seen The Dish) may remember that in the early days of the Space Age contact with orbiting spacecraft was intermittent and was available only when the spacecraft was over a ground-based relay station; the TDRS satellites and associated ground stations make this problem a thing of the past, so this launch is important because it provides support for a whole bunch of present and future space development. The one-day event began bright and early for me, with a 5:30 wake-up call (I’d gotten to bed at midnight, due to computer problems delaying my Chicago-Orlando flight) for an unofficial breakfast at a coffee shop popular with Shuttle astronauts. I met about a dozen of the attendees, including SF writer Mary Louise Davie, before we all proceeded to the Badging Office for our official credentials. Let me pause for a moment to tell you a few things about the Kennedy Space Center. First off, it is ENORMOUS. We had a map which made it look reasonable, but as you drove around you soon realized that each “block” on the map was actually several miles. This is explained by the presence of large amounts of explodey stuff, but the amount of time we spent getting from one place to another, even within buildings, was extraordinary. KSC is also a weird combination of futuristic and historic. NASA is all about looking forward, exploring unknown planets, building new technologies… but most of the buildings and structures date from the Cold War era and are strongly associated with historic events from the 1960s and 1980s. 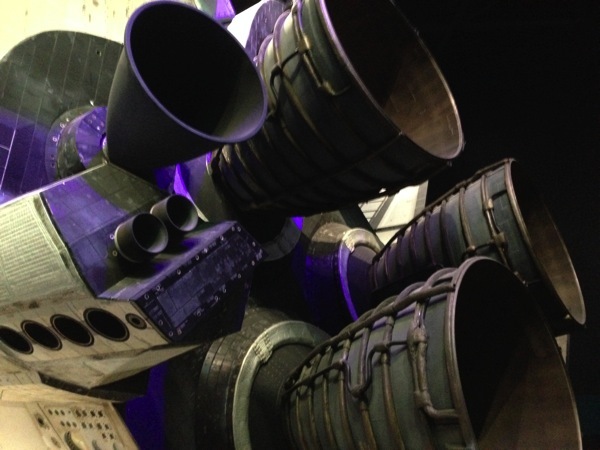 Just about everything you see is purpose-built and/or one-of-a-kind — even the manufactured items, like boosters, are complicated enough that each one is unique — so, despite the very high tech level, there’s a peculiar handcrafted feeling to the place. 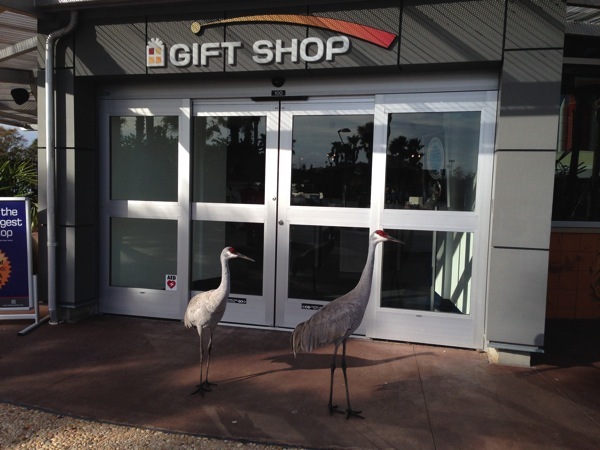 And, being so large and open, KSC is also a wildlife preserve and boasts a large population of birds, gators, and other creatures. There were always hawks and buzzards circling overhead, and sandhill cranes stalking around. From the badging office we drove to the press center, which would be our headquarters for the rest of the day. 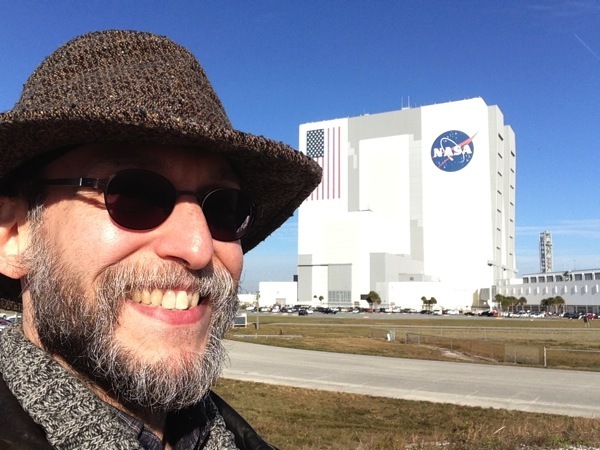 Several of us parked in the lot with the NASA Social sign, right across the street from the massive Vehicle Assembly Building, and walked to a large shiny building nearby, but no one there was expecting us. 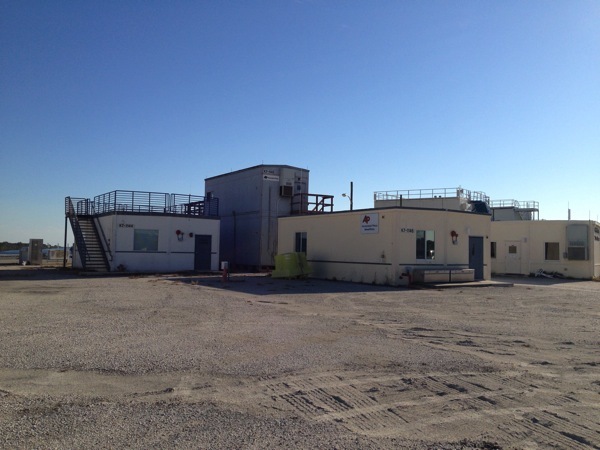 The press center was, in fact, a collection of junky-looking concrete-block boxes on the other side of the lot, which looked more like a water treatment plant than anyplace we were supposed to be. However, as I got closer to the boxes, and saw the names of CBS, AP, Reuters, and other news organizations on their sides, I recognized them from the days of the Space Race. Each of these boxes had once been filled with reporters, their roofs crowded with photographers with telephoto lenses the size of cannon, for every space launch. 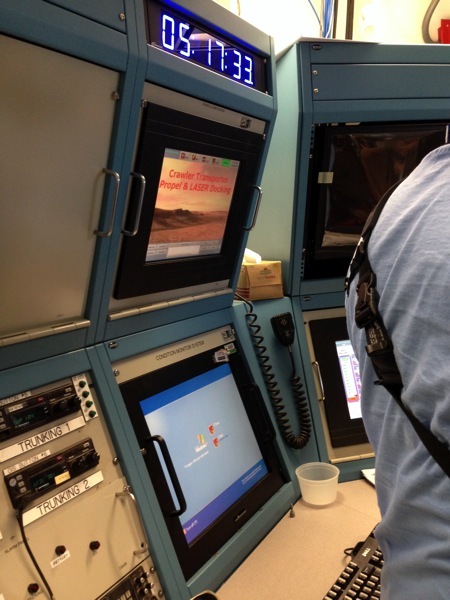 But today, for a technically-significant but routine satellite launch, we were the only journalists visible. Inside our assigned box we found long tables with power plugs, iffy wifi, and numerous large TVs showing the rocket on the pad. Once we had all checked in, we went around and introduced ourselves. There were about 35 of us — out of 600-700 applicants, 50 had been invited, plus waitlisters, but not all had actually made it (one of us had been on one of two non-canceled flights out of Boston, due to the snow storm, the previous day). All of us were passionate about space: SF writers, bloggers, techies, journalists, social media mavens, students, librarians, filmmakers, and more. It was a pretty awesome set of credentials, actually. The demographics were similar to an SF convention: maybe one-quarter women, two black people, one asian person, two hispanics, the rest white guys. Once we’d done our introductions and orientation (cameras were allowed everywhere we’d be today, we learned, but no matches or lighters are permitted in the VAB because it’s an “ordnance facility”), we piled into a bus and drove out to launch complex 41 to meet the guest of honor: the TDRS-L satellite on its Atlas V booster. There we posed for our official group photo and goggled at the fact that we were actually here. You can see railroad tracks in the lower right of that picture. They lead to the Vertical Integration Facility nearby, a tall skinny building where the stack of first stage, second stage, and payload is assembled before being moved to the pad for launch. From pad 41 we drove past pad 39-A, where the Shuttle launch structure still stands (for now), to pad 39-B, where we got out and walked into the “flame trench” where the rocket exhaust is directed horizontally during launch. Fortunately there was no launch occurring at that moment, or my report would end here. You will not go to space today. Fortunately. 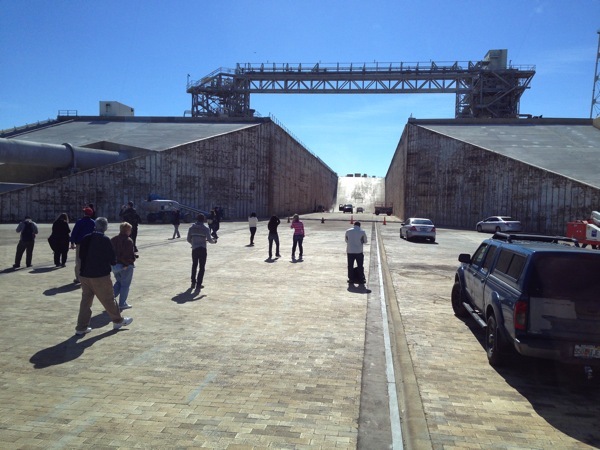 A launch pad, or Launch Complex to give its proper name, is a lot more than just a concrete pad for the rocket to stand on. 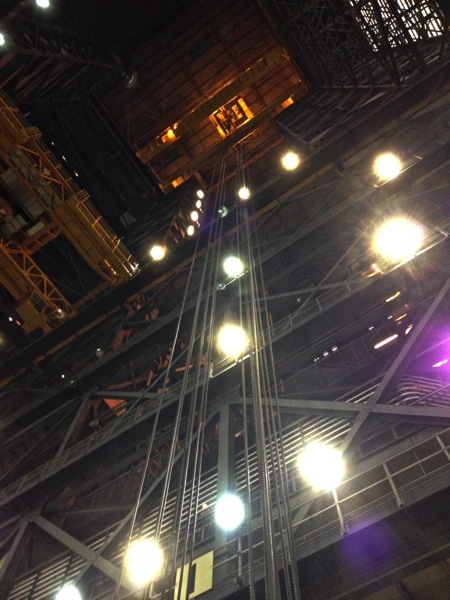 It is surrounded by towers, connected together by two-inch-thick cables, which form a Faraday cage protecting the vehicle on the pad from lightning (they get hit by over 100 lightning strikes per month — Florida can be stormy, and it’s flat). Tanks for liquid hydrogen and liquid oxygen stand nearby — well, not too nearby, a quarter-mile away from the pad and each other — to fuel the rocket before launch. And a giant water tower stands ready to dump 350,000 gallons of water into the trench in 7 seconds for noise suppression during the launch. Pad 39-B is currently being refitted for the Space Launch System (SLS) — a new booster system which in its largest configuration is taller and heavier than Saturn V — which is set to go into service in 2017. The old fireproof brick has been stripped from the walls and floor of the flame trench, and will soon be replaced with something even more fireproof. And miles of Apollo-era wiring (data and telemetry cables) are being replaced with fiber optics. From the pad we went back to the press box for power and wifi for our devices and, incidentally, lunch for ourselves (on our nickel — we had our choice of Subway or not-too-shabby Sonny’s Barbecue). While we were eating, several large TV cameras were set up in the room — we would be the audience for a live presentation on NASA TV about the TDRS launch. 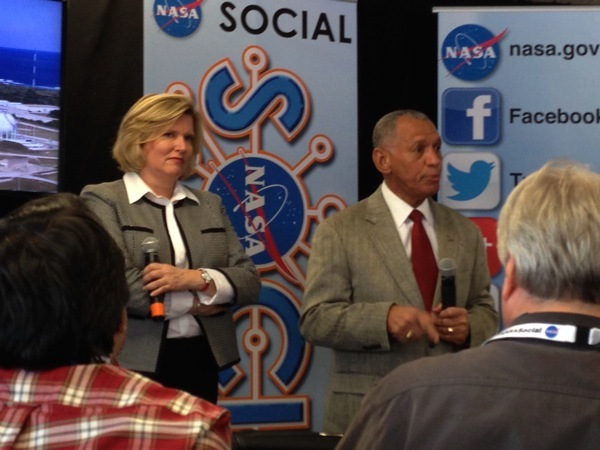 The first speakers were Charlie Bolden, former astronaut and current Administrator of NASA, and Acting SBA Administrator Jeanne Hulit. “NASA lives and breathes small business,” she said. “Much of Curiosity was built by small businesses.” In response to a question about TDRS, Bolden said that “TDRS makes an astronaut’s life miserable” because the constant communication it provides means there’s no time the “guys on the ground” can’t bother you with questions and commands. 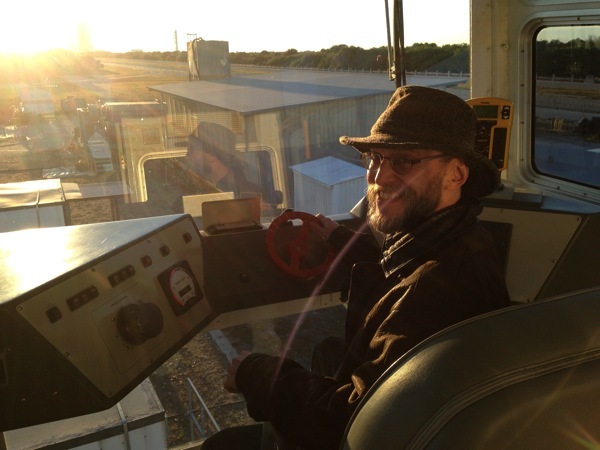 I got to ask Bolden a question on the air about NASA’s plans for Mars exploration. His reply: they’ll be testing the Orion capsule for Mars return in 2014, putting the SLS heavy lifter into service in 2017, planning an asteroid mission in about 2021, and intend a crewed mission to Mars in the 2030s. The administrators were followed by Marco Toral, TDRS Telecommunications System Manager, who discussed the history of the TDRS program. TDRS started out to support human spaceflight, then added support for space science, earth science, and expendable launch vehicles. Thanks to TDRS, there is no longer a communications blackout period during re-entry: the signal that can’t go down (because it’s blocked by the hot plasma ahead of the spacecraft) can go up to the TDRS satellite. TDRS handles 17 terabytes of data per day, worldwide, 24/7, with better uptime than AT&T. TDRS-L’s two dish antennae are made of carbon fiber and are “folded like a taco shell” for launch; the Centaur upper stage is a “balloon tank,” supported by internal pressure like a soda can. Next up was Badri Younes, NASA’s deputy associate administrator for Space Communications and Navigation (SCaN), talking about NASA’s communications infrastructure. Without communications, he said, a space satellite is expensive junk in orbit; even human astronauts would be badly impaired. TDRS-L will be sent to an initial location in orbit, then after testing will be migrated to its final geosynchronous position. What becomes of older TDRS satellites? “When we are done with a satellite we don’t just throw it away, we retire it to a happy home 300km above geosynchronous orbit.” NASA’s communications are moving to higher frequencies (Ku and Ka bands) to deliver higher bandwidth and avoid interference, but at high frequencies the surface of the dish antenna must be extremely smooth. Pretty soon they will have to move to optical technology (ultraviolet lasers), which offers nearly unlimited bandwidth. Coming soon: full-speed streaming video from the Moon and Mars! Future radios will be extensively reprogrammable with “cognitive” technology; much of this tech will become commercial products. NASA is also working on disruption-tolerant store-and-forward data protocols, because TCP/IP is too sensitive to latency for use in space. 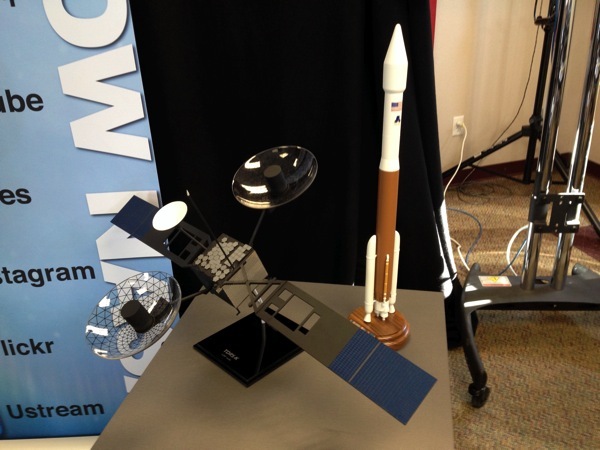 Cool fact: TDRS will be supporting the launch of TDRS-L tonight (“Older brother helping out the younger”). Next on the agenda was something described only as “Special News Conference.” We walked to another building in the press center, this one a lot larger and better appointed, and took seats in the audience of NASA’s TV studio along with a bunch of real other journalists. The event turned out to be the official announcement by Sierra Nevada Corporation that they have signed contracts to conduct Dream Chaser operations in Florida, beginning with an orbital test launch in 2016. 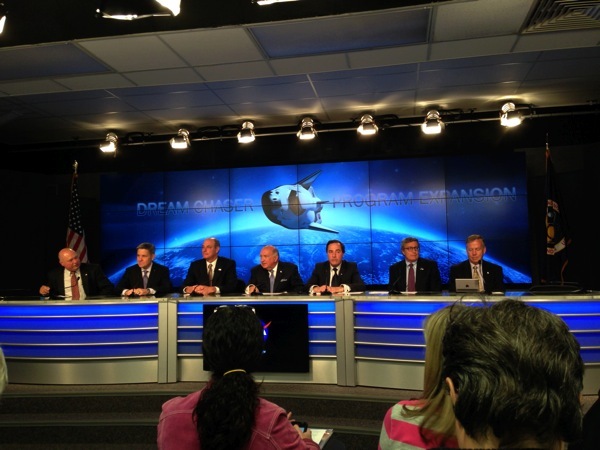 This is very big news for Dream Chaser, Sierra Nevada, Kennedy Space Center, and the state of Florida and we were privileged to be there for the announcement. Dream Chaser is a “reusable crewed vertical-takeoff, horizontal-landing lifting-body spaceplane” — a smaller, lighter version of the Space Shuttle for exploring, working, and discovering in space — scheduled to begin service in 2017. Like the Shuttle, it takes off like a rocket, lands like a glider, and can be refurbished for multiple launches. However, it is much smaller (designed to take people, not satellites, to space) and sits atop a standard Atlas V booster like a satellite rather than being strapped to the side of an external tank with solid-rocket boosters like the Shuttle. Dream Chaser will be able to travel KSC-ISS or ISS-KSC in less than 8 hours. The first Dream Chaser orbital flight, scheduled for November 2016, will be autonomous (non-crewed); the second flight will be crewed. One of the people on the podium was astronaut Steve Lindsey, who reflected on the challenges of landing the Shuttle and says that his Dream Chaser test landing went very smoothly. A chance remark of his made me realize that we were in the same press room used by NASA after shuttle landings here, which was kind of a “whoa!” moment for me. The Shuttle, they acknowledged, was supposed to be a lot easier and cheaper to refurbish than it was, but Dream Chaser expects to learn from its experience and actually achieve that promise. Dream Chaser’s design is very similar to the Shuttle’s (lift/drag and crossrange capability are near identical) but it lacks the design compromises that made the Shuttle so large, heavy, and expensive and it is much simpler (e.g. will not be using hypergolic fuel). After the press conference we had an opportunity to talk with the people from Sierra Nevada, KSC, and NASA and to take pictures on the fancy podium. Then we all piled into buses for the next part of our tour. Which was, in my opinion, the coolest part of the day. 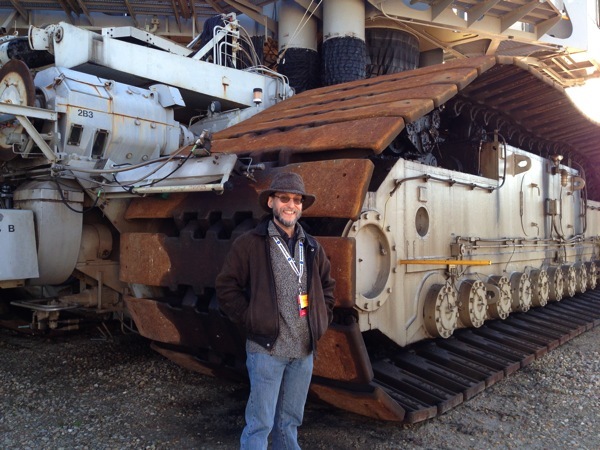 We were actually the first NASA Social group to ever be allowed to climb on the Crawler Transporter!! The two Crawler Transporters (nicknamed Hans and Franz, apparently, though I don’t know which one this was) were built to carry the Apollo Saturn IB and Saturn V rockets from the Vehicle Assembly Building to the launch pad, then used for the Shuttle, and are now being refurbished for use with the Space Launch System (are you sensing a theme here?). They are almost 50 years old, but they have less than 5,000 miles on the odometer so they’re in great shape for their age. MPG? 125 gallons per mile. They drive on a “gravel” road of Tennessee River rock, which is crushed to sand by the weight. They took us inside in small groups, leaving the rest of us to wander around the outside and take pictures. 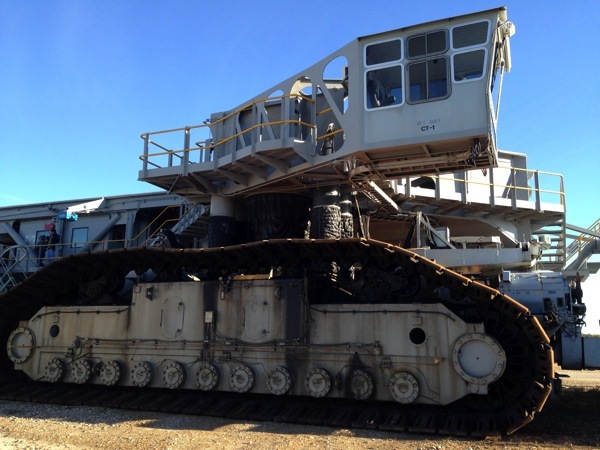 It is really an amazingly huge vehicle. I never found anywhere from which I could take a picture of the whole thing. 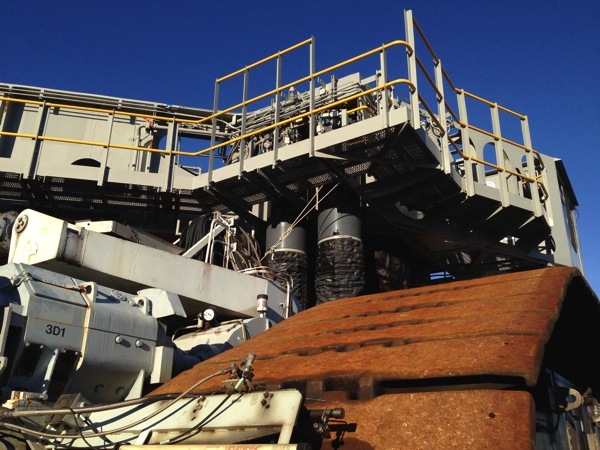 The crawler has a laser guidance system with a precision of ¼ inch, for precise alignment with the VAB on one end of its trip and the launch structure on the other. As it travels, the top of a Saturn V rocket deviates by no more than 12 inches from true vertical, generally much less. There is some vibration — one Shuttle astronaut freaked out when he saw how much the tail was shaking — but the Shuttle is built to take much more vibration than that as it launches. The sun was beginning to set as we piled back into the bus and headed off to our next stop. There was no doubt where we were going. Not only was it listed on our agenda, it dominates the horizon for miles and we were heading straight for it. The Vehicle Assembly Building. 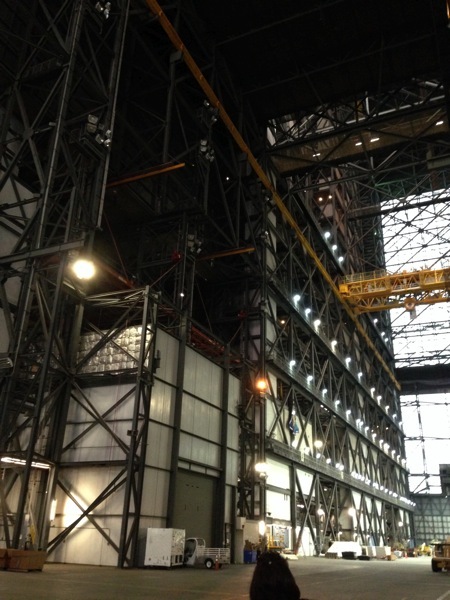 Everyone knows that the VAB is the largest single-story building in the world and has its own weather. But I had not realized just how complicated it is. For one thing, the vehicles are not assembled in the middle as I had thought. There are actually four “cells”, or bays, two on each side of a central corridor, and each cell is big enough to hold a complete Saturn V. This is a factory for building fully-assembled skyscrapers, and it can build four at a time. Three of the cells are being refitted for the SLS (because of this work, the VAB will close to tourists in February), and they’re looking for a commercial partner such as SpaceX to rent the fourth. The whole thing is so vertiginously huge that it’s hard to comprehend. The pieces of each vehicle — the boosters, upper stages, and payloads — come in horizontally through the short (by comparison) door at one end of the main corridor. This door had an extra “flap” added the top to accommodate the Shuttle’s tail (you can just see it in the lower right of the picture above). The pieces are then lifted by cranes, rotated to a vertical position, moved into one of the cells, and set down on the piece below. Gantries and platforms extend from the walls of the cell to hold the vehicle vertical and allow workers access. When the vehicle is fully assembled and the Crawler arrives at the VAB, it drives into an enormous “slot” at the bottom of the cell and raises itself up until it meets the bottom of the spacecraft, which is then released from the VAB and settles its entire weight on the Crawler. The giant doors on the side of the building then open and the whole assembly drives away. It’s kind of mind-boggling. The thing above, the size of a small house, is called the “water bottle.” It is filled with water and used for load-testing the cranes. Sitting in the middle of the central corridor, so small by comparison that it could have been overlooked, we saw this: the Ground Test Article for the Orion capsule. Development on this four-person capsule continued when the Constellation program was canceled, and it will be used with the SLS to take people into space. 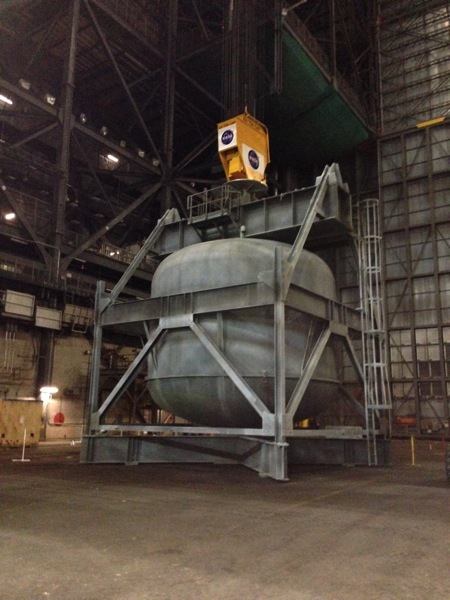 The Ground Test Article is a full-sized mockup of the real thing which is used for testing procedures like vehicle assembly. 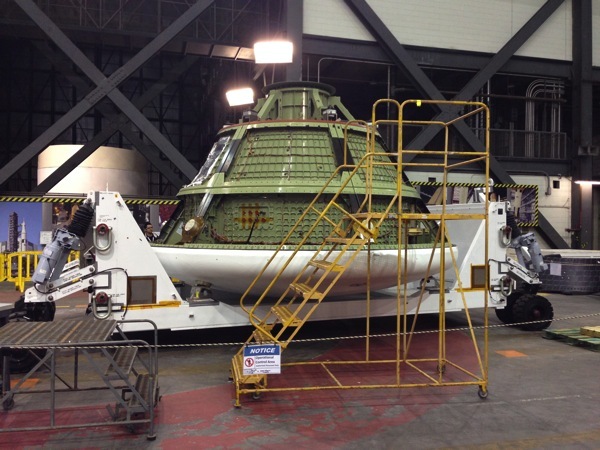 The white cylinder in the background is the GTA for the Orion service module. We left the VAB and went back to the press box for a quick dinner (the BBQ place was closed, so we had our choice of Subway) before the launch. Then we all piled into buses to take us to the launch viewing area. We watched the launch from the brand new Static Test Road viewing site, about 4 miles from the pad. Because the site was one that had not been used before, we ran into a tense moment when it wasn’t certain that the buses could make the last turn. But we made it there in plenty of time. Unlike the Shuttle launch I saw in 2010, when we waited on the bleachers for hours and hours, for this launch we arrived at the viewing area less than an hour beforehand. Good thing, too, because this viewing site didn’t even have bleachers… it was just a roped-off section of roadside, with no seating or other facilities. (The ropes were for our protection, because swamp. Also alligators.) We had a great view of the launch, though, about four miles away across the water. I don’t really know how big the site was or how many people were there other than us, because it was very dark, but there can’t have been more than 100 of us at that site, plus one local news van. It was a very convivial bunch. As there weren’t loudspeakers at this site, we relied on people watching NASA TV on their phones, plus one person in ham radio contact with someone back at the press center, for updates on the launch. Everything went smoothly… right up until the final two-minute countdown was about to begin, when they polled everyone (the classic round of “Go for launch” from every team involved) and one person said no. Some kind of problem with data drop-outs. Apparently the universe had decided that a space launch isn’t really a space launch without at least one moment of drama. We bit our nails. There was only a 40-minute launch window. Would the problem be resolved in time? Would we see the launch tonight? I could stick around for one more day, but not all of us had that much flexibility. If we missed this launch window, I didn’t know when the next one might be. I’d like to take a moment to consider the team who was working to resolve the problem. Can you imagine the pressure? Millions of dollars of hardware and years of work might depend on fixing the problem, fixing it right, and fixing it now. The countdown resumed, right down to zero. 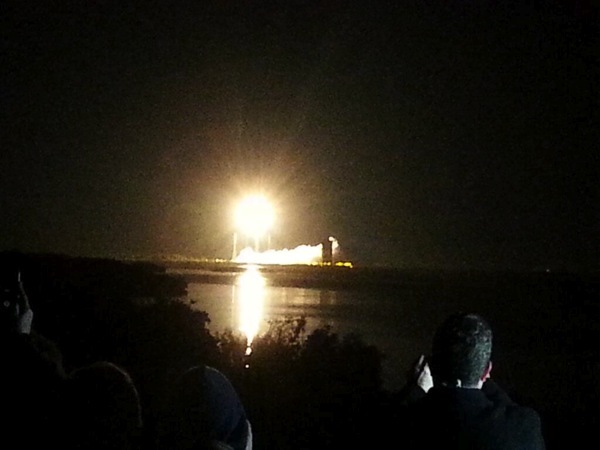 The engines lit up and the rocket zoomed into the sky, followed a minute later by the roar. It was like a fireworks show with one enormous firework. I followed the rising craft through binoculars; at one point I saw a bloom of vapor, looking like a coke-bottle-shaped jellyfish, which I later learned was the vehicle passing through “max Q” (maximum dynamic pressure from the atmosphere), and then just as the main engine cut off I saw a lovely flower of gas and flame high in the starry sky. And that was the end of the show. I must confess that I was not as overwhelmed by the actual launch as some. But it was still a very cool thing, and if this one part of the day was not quite as impressive as I had hoped, it was more than made up for by the rest of the experience. 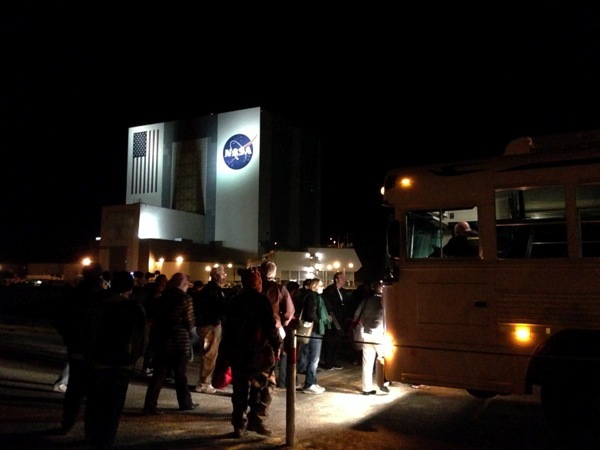 After the spacecraft vanished into the sky, we piled back in the buses and drove back to the press center. There we said our goodbyes and headed back to our cars. There was an afterparty (and I’m told it was a blast, especially when the people from United Launch Alliance showed up) but after two consecutive nights of less than five hours sleep I was simply not up for it. So that was my day at the TDRS-L NASA Social. But my trip wasn’t over yet. I had booked my flights and hotel for an additional day, just in case the launch was delayed, and the dozen or so of us who were staying over were offered free tickets to the Visitors Center. So the next morning, after a decent amount of sleep, I headed back to the coast. The Visitors Center was designed by people who learned a lot from Disney, and I’d definitely recommend it if you’re in the vicinity. It has a lot of historic space hardware, informative interactive exhibits, and a very nice bus tour of the Kennedy Space Center (which I skipped, having seen most of it either on the previous day or on my previous visit in 2010). We got a nice meet-and-greet, and photographs, with astronaut John O. Creighton. I didn’t ask for an autograph (I don’t usually do autographs at all), but as it happened I did wind up with an autographed photo, which was free with purchase at the gift shop. But the highlight of my visit was the Shuttle Atlantis. The Atlantis exhibit is in a building about as large as the rest of the Visitors Center put together. You enter under a full-sized mockup of the External Tank and Solid Rocket Boosters, then are treated (and I really do mean treated) to a pre-show. I just wrote a complete description of the pre-show, then deleted it. Because if you ever do get a chance to see the exhibit (and I highly recommend it, if you are in the vicinity) you’ll enjoy it more without spoilers. Suffice it to say that it was rich in both information and emotion, ending with a spectacular reveal of Atlantis. The retired space plane is an amazing sight. 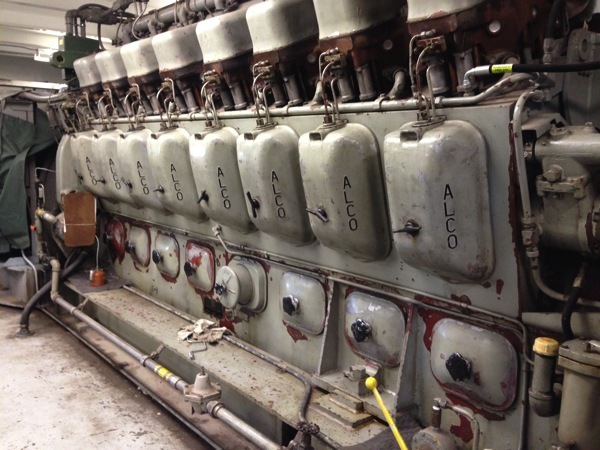 You can get almost close enough to touch it, and volunteer docents can answer any questions you have. My little group spent about 45 minutes talking with a retired Shuttle QA engineer. But the shuttle itself is only half the exhibit… it’s surrounded by a full-sized museum about the Shuttle, the technology behind it, the missions it’s flown, the hardware it’s carried into space, and the people who built and flew it. All of which were especially resonant for me, because the only other launch I’ve ever seen was Atlantis, her penultimate flight in May 2010. The last thing in the exhibit before the gift shop is the Shuttle Launch Experience, a theme-park-style ride which was something I was really looking forward to. But, as regular readers of my blog may recall, I have an eye condition called posterior vitreous detachment in one eye, which sounds much worse than it is, but carries a small chance of retinal detachment. My eye doctor had told me “now would be a bad time to take up kickboxing,” and I was concerned that the shaking and G-forces of the ride — which many Shuttle astronauts say is about as accurate as you can get — might be bad for my eye. I had decided that I would probably be okay, but at the last minute, as we were lining up for the ride, I decided to call my eye doctor just to make sure… but he wasn’t in. I left a message, decided “better safe than sorry,” and told the people I was with to go on without me. The ride was very cool, a multimedia flight simulator like Star Tours but with a lot more science behind it, and the ride and pre-show were both entertaining and informative. I was particularly amused that the ride video was presented by Charlie Bolden, who had been just an ex-astronaut when the presentation was filmed but is now the Chief Administrator of NASA… and I’d just met him! After the Launch Experience my little group split up (we’d been drifting into smaller and smaller groups as the day went on) and I spent the rest of the day seeing the rest of the Visitors Center by myself. Which was okay, but I was very weary after all the excitement, and I got kind of depressed and lonely after a few hours. I saw the 3-D IMAX movie about the International Space Station, which was excellent, and then went back to my hotel. Except for one thing: as I was leaving the IMAX theatre, I noticed a small exhibit space under the seating area. There was no signage at all, and no one inside, but I saw the lighted display cases and decided to poke my nose inside. 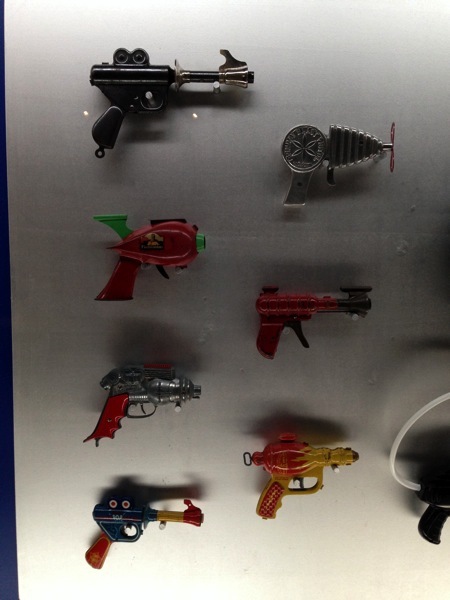 It turned out to be a display of hundreds of space-related toys from the early 20th century to the present, and I’m very glad I saw it. So that was the end of my adventure… except that, as with the launch, apparently the universe had decided that what I needed was one last bit of drama. After a brief nap, I went out for dinner (mediocre Chinese), then stopped off on the way back from that to pick up a sandwich for the plane the next day. But as I pulled into the sandwich shop’s parking lot, I heard and felt a snap as the little plastic button on the gearshift — the one you push to change gears — broke and fell right off in my hand. Without that button I could not shift into any gear other than Drive or Neutral, nor could I remove the key from the ignition. And I couldn’t get out of the parking space without Reverse. After I got back to the hotel, hours later than I’d planned and with a 3:30am wakeup call for my flight the next day, I was pretty upset. But I reflected that if something like this was going to happen to my car, this was actually the very best time in the trip for it to have done so. Any other time and I would have missed something — maybe even the whole thing, because there was a strictly limited window to pick up your badge and credentials. I feel very fortunate to have had this adventure, and extend my sincere thanks to everyone at NASA and the Kennedy Space Center who made our visit possible. If you would like to attend a NASA Social yourself, check out http://www.nasa.gov/connect/social/ for information on the NASA Social program, upcoming events, and how to apply. David D. Levine, Orycon regular and minor (?) deity, got to go hang out at NASA!